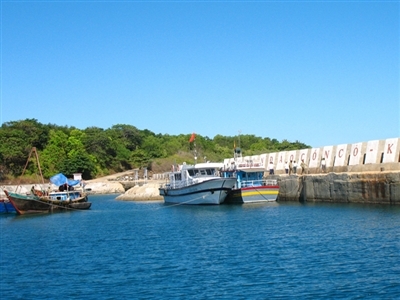 The evergreen island is 80 percent natural primeval forest, which has remained in pristine condition despite the passage of time. It was formed by a volcano which left behind giant, strange shaped basalt rocks and many stunning beaches that have turned the island into a charming and splendid place. The flora on the island is very diverse, with many giant trees, measuring 15 to 20 feet across. Some are unique to islands, such as the striped-trunk trees and many kinds of wild potatoes with huge leaves. The island is also home to a rich array of marine life with 113 types of coral, 57 kinds of seaweed, 19 different crustaceans, and 224 saltwater fish species, as well as 164 species of flora and 68 types of fauna and seafood such as oysters, lobsters, crabs and mussels. There are two endangered species of crabs on the island that are able to live on the ground or in the water and are strictly protected. People have come from the mainland to settle on Con Co for hundreds of years and many soldiers have sacrificed their lives to protect it. Local authorities plan to invest about VND300 billion to develop infrastructure on the island to improve local living standards and tourism. If you had seen the island of Con Co a few years ago, you would be taken aback now to see. In addition to the heaving rocks, dense primeval forests and military barracks, many tall buildings, including the headquarters of the district People’s Committee, police and tax offices, a health center, power and water services, as well as television and telecommunications systems. However, there are no guesthouses or hotels. Local tourism is still very much in its infantry.